While modern Bosnian history has pivoted on the divisions between Muslim Bosniak, Catholic Croats, and Orthodox Serbs, Bosnia has also been home to a vibrant Jewish community. The majority of Bosnia's Jews were Sephardim, expelled from Spain in the 15th century and granted refuge in the Ottoman Empire by the Muslim Sultans. 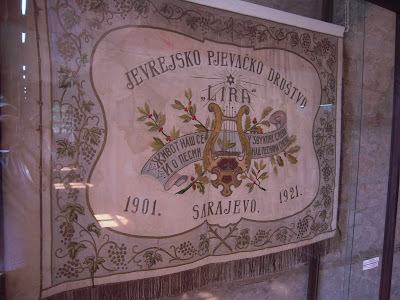 Sarajevo's Jewish comunity dates from the early 16th century, and by 1900 Jews comprised about 12 percent of the city's population, and about 100% of its doctors. Other towns had (and some still have) smaller Jewish communities, enlarged by Ashkenazic immigrants after Bosnia was annexed by the Hapsburgs to Austrian rule in 1828. 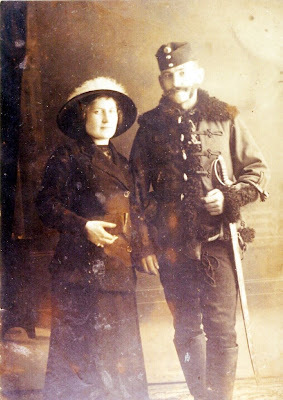 My maternal Grandmother was born in Travnik in 1896, met my Jewish Hungarian Grandfather during WWI - while he was serving in the 19th Jász-Kun Huszár regiment - and moved to Hungary after the war. 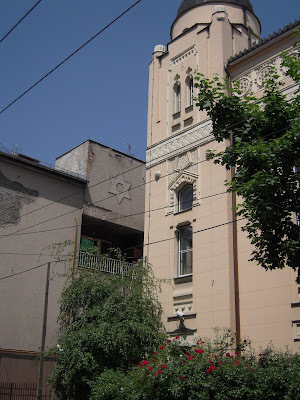 Today, the Ashkenazic Synagogue is the center of Sarajevo Jewish life, although the majority of the congragation is of Sephardi origin. 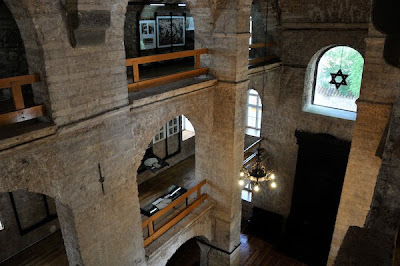 The Jews of Sarajevo - as in most of former Yugoslavia - lived in a tolerant cultural atmosphere almost devoid of the antisemitic poison that prevailed in pre-WWII Europe, and it all the more tragic that they were almost entirely destroyed during the Holocaust. Local Muslims and Christians were active in saving the lives of many Jews, and Jews were prominent in the Yugoslav Partisan movement, such as Moshe Pijade, Tito's right hand man. 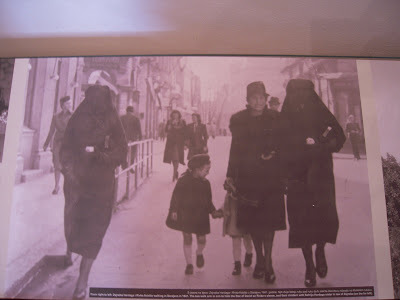 There is a photo in the Jewish museum of a Jewish Woman - wearing a Jewish star armband - walking along the main street of Nazi-occupied Sarajevo arm in arm with her Muslim friend, a woman maintaining the tradition of a complete face veil, their daughters holding hands. 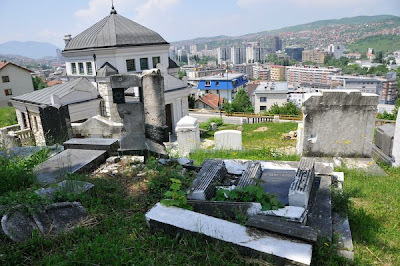 There are no Yiddish speakers in Bosnia at all anymore, and most of the Ashkenazic community has Hungarian Jewish origins as can be seen in their names, especially when visiting the cemetery. The Cemetery in Grbavica was one of the prime sniper posts during the siege - it poked down the hill straight into a clear rifle shot at the main downtown square. 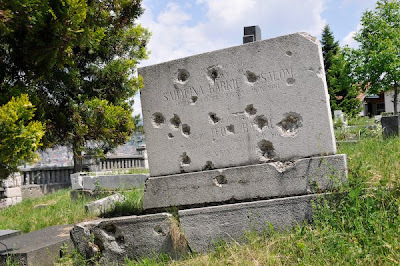 Serb paramilitary poured gunfire and shells into the modern center - named "Sniper Alley - and, on retreating, heavily mined the cemetery, which was only declared safe again in 2006. Personally, I don't consider mine fields to be fun, so I asked at the Synagogue and I took it on trust that the cemetery was safe and caught a cheap cab ride up the hill. Personally speaking, blowing one's self up can be a bummer. A lot of the hills surrounding Sarejevo are still dangerous for hiking, due to the thousands of antipersonnel and land mines laid during the 1990s. A majority of the stones in the Grbavica cemetery were damaged or destroyed during the siege, but restoration efforts are being made - the priority, however, is for the living. After a long walk downhill it was time for lunch. We passed a lot of Americans in suits in the downtown area and I wondered if Obama was in town for some kind of meeting - I would have loved to take him to Zeljo's for some meat. But it was only Joe Biden, and I didn't see him at any of our Bascarsija hangouts so the Vice Dude just missed out on the good stuff. No, I did not eat the cevapi for every single meal in Sarajevo... although that would be easy for me to do. 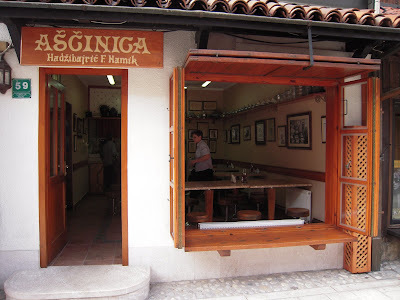 For the sake of variety, we chose a famous stew and soup house, an Ascinica in the old town. 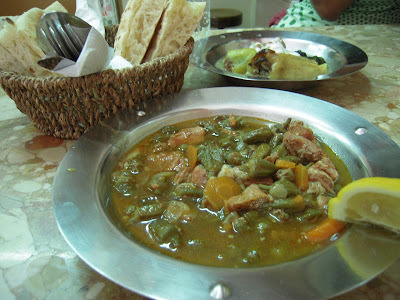 I ordered the bamija, an okra and veal stew, while Fumie went for a plate of meat-stuffed everything: stuffed peppers, stuffed grape leaves, stuffed zucchini, all served with soft and puffy somun bread. As much care and heritage was evident in this meal as in any of the famous cevapdzinicas we tried. Finished it off with a Bosnian coffee and a kadaif. 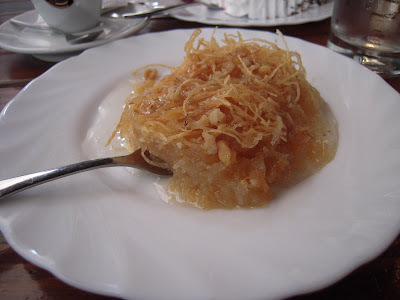 Bosnia is proud baklava country, but the kadaif - a noodle version of baklava - was almost like a pudding of nuts and noods swimming in syrup. The destruction of the Jews during WW2 is much more noticeable in eastern Europe than it is in the west. 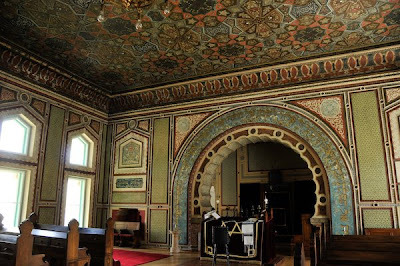 Every town in Hungary seems to have an abandoned synagogue or two. Thanks for linking to my article on Pijade too. I think the pre-1941 Jewish population of Sarajevo was higher than 12%. From what I just read, it was closer to 35%. That's info coming from Jakob Finci....a leading member of the Sarajevo Jewish community.